The illegal polythene at the Dompe Landfill Site. 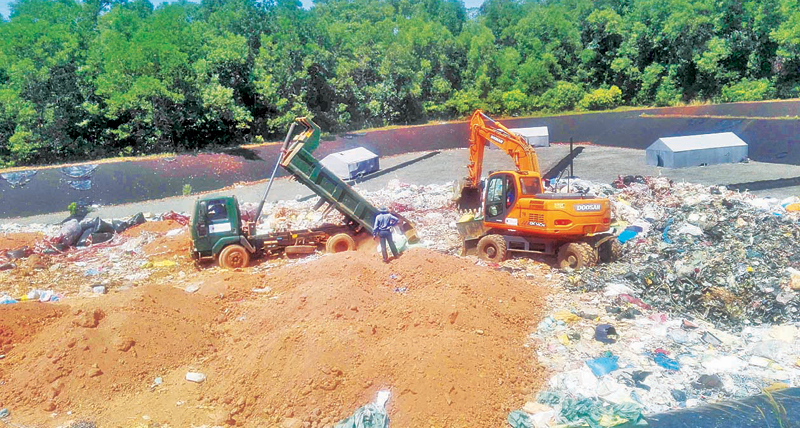 As per the court order given by Gampaha and Kadawatha Magistrate, about 2,680 kg of seized illegal lunchsheets and polythene products from Yakkala and Ganemulla areas has been destroyed at the Dompe Landfill Site recently. The CEA conducted many raids to capture the banned polythene manufacturers and sellers, jointly with the Consumer Affairs Authority (CAA) and the Police Special Unit during the last year. As a result, the inspection team has been able to take into their custody 1,830 kg and 850 kg of non-compliant polythene from Yakkala and Ganemulla factories respectively and the CEA pursued legal action against the accused in the Gampaha courts. A total of 2,680 kg of non-compliant polythene was destroyed on January 29 at the landfill site in Dompe, under the supervision of W.M.M.B. Weerakoon, Assistant Director, Investigation, Udamina Jayathilake, Manager, Landfill site, Dompe, J.A.M.P. Jayakodi of the CAA and E.A.N.S. Edirisinghe.